My Experience With Cooking: Kuku Sabzi-Reposted for SWC-Cooking With Greens Event! 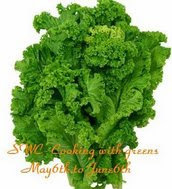 Kuku Sabzi-Reposted for SWC-Cooking With Greens Event! Thanks a lot pooja for such a unique and lovely post. Very delicious entry..
Thats a interesting and very unique dish Pooja! I had left a comment before on this post, but its not seen, what happend? it is always nice to hear about other dishes from other lands - I enjoyed this post and I would one day like to enjoy this dish. This one only has few excerpts from the original one! Thanks DB. I too love to learn about other cusines whenever I get a chance! Thanks Yasmeen, yes it is similar except for few additional ingredients. Unique & interesting omelett with herbs. Lovely entry. Kuku sabzi looks delicious! Nice entry! Very Unique post Pooja..Looks great and sounds healthy..
great dish.. Good clicks.. Thanks for the comment.. BTW, Sorrakkai means Bottle gourd. Thanks to you, I have updated it in my blog. Hi, I am hosting an event called 'The potluck - chicken' . Expecting all your support and yummy dishes there. Hearty welcome dear. Everything seems nice and new to me. Love the spread, dill rice a must try one for me. Thanks Hema :) and for the translation too.